Those of us who have pets, want them to have the best environment possible. Especially those with dogs, the ultimate outdoor backyard is important to keep your canine happy. With the Texas summer heat rolling in, sometimes this isn’t always possible. It’s difficult keeping grass healthy, green and luscious. Some of us even have trouble with stickers finding their way in the house from shoes, and the pesty things getting stuck in your dog’s fur. One of artificial grass’ primary benefits is the fact it’s so pet friendly. Pets are bound to spend so much time on this one product, so the criteria must include durability. From digging to pounding and playing, synthetic grass can withstand rough play from even the largest of dog breeds. The complex polyethylene fibers have a weaved composition, making it sturdy to hold up during high performance. An additional benefit of the polyethylene fibers is the nontoxic component. This is why it’s used so often for dog kennels, pet hotels, dog runs, you name it. The feel is comfortable as well and is most suitable for many pets at once. Its state-of-the-art draining system allows drainage to permeate through easily and effectively. Pet odors are kept at a standstill as well. However, just make sure to wash off the turf with a hose and water to clean off solid waste. The best part is, the grass will never erode or change in colors. Texas Custom Turf has had the pleasure to work with many pet yards, and all the dogs hit it off well with the new surface. 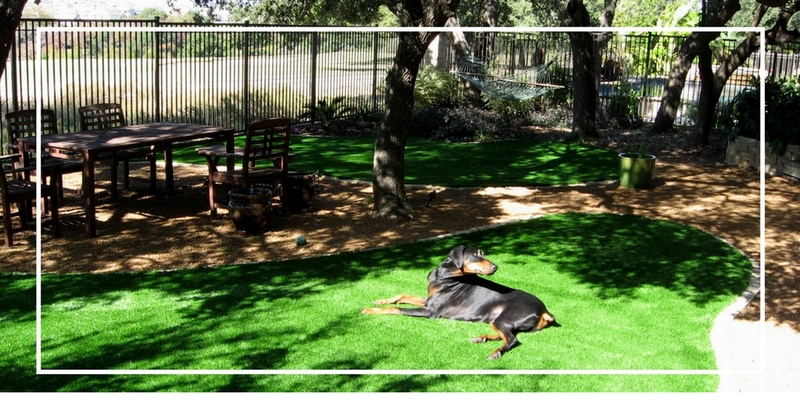 Below are some of the projects Texas Custom Turf has worked on — some were specifically for dog runs, while others were for recreational use that the owner’s pets still found enjoyment in.